In large bowl, gently mix all ingredients. In search of sparkle? You can find it at craft stores in the cake decorating department or baking specialty stores. If you still have trouble tracking it down, just use your favorite colored sugar instead. Make it a popcorn party (cuz we all know that popcorn is the ultimate finger food for watching the fall TV premiere of Glee 90210 that highly intellectual new documentary your favorite show. 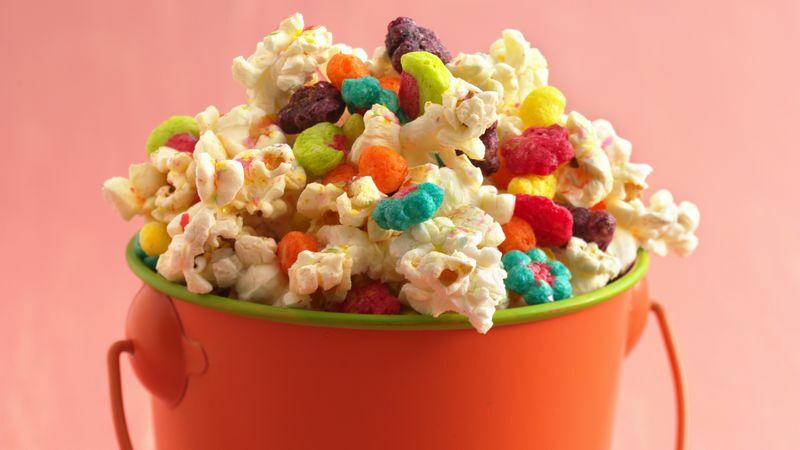 Invite some friends over for a fab spread of popcorn with DIY toppings. The best way to pop corn for your popcorn party is to use a popcorn maker (I’m partial to air popper ones). You can prepare the popcorn maker to run (adding popcorn and oil if using a maker that calls for it) before the guests arrive. But wait until the party has started to actually run the machine. Popcorn only takes a few minutes to make and it’s kind of fun to see it happen. Lay out popcorn bags (you can find them online at stores like Etsy.com or sometimes in brick and mortar stores like World Market, Target and HomeGoods). If you can’t find the whimsical old-fashioned style bags, brown paper bags work well too. And they are super cost effective. Now, if your guests are eating super hot, just popped popcorn, you can sometimes skip this step. But you might not want to. Giving the popcorn a little spray of cooking oil spray (olive oil spray works too!) helps the toppings adhere to it really well. And it doesn’t take a lot. Guests can pick and choose, creating their own cool and delicious topping combination. It’s a lot of fun! What combination would you choose first?